Hey! Where is my dos.library?? I have provided you another log (well, call this debug output a screenshot if you like). What you may see here is a list of modules present in kernel (remember, some of them have been loaded separately, by GRUB) and a very early startup process of whole AROS. The new and interesting things are timer.device, irq.hidd and ata.device. The timer.device is a straight recompilation of x86 version. It still does not use the local APIC driven by at least 66MHz source, but uses an ancient 1193180Hz timer. It will change very soon since the new APIC timer has been proven to work properly on AROS. I need some spare time to implement it in timer.device now. There were two more “cosmetic” changes – the timer.device checks the SysBase->Elapsed field and reports forced reschedule if needed. 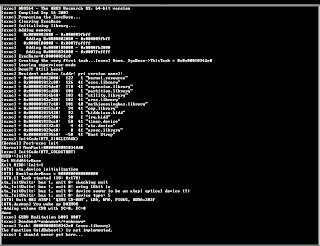 Additionally, timer.device uses kernel resource to add/remove it’s interrupt handlers. The irq.hidd is a simple wrapper for kernel.resource. Used to add and remove IRQ handlers. Nothing less and nothing more. Boring, huh? PS. You may ask about this nasty GURU down the screen. Well, it puzzled me a bit until I’ve found it. It’s a BootStrap which cries loud that it could not open the dos.library 🙂 So, where’s my dos.library, dude??? Next Next post: Found dos.library!